The INS9000 stands elegantly with its pristine white backwalls that are accentuated by the internal mood lighting creating a relaxing ambience within the cabin. With two seats moulded into the design, relax in comfort whilst listening to music via the Bluetooth control panel. Sporting 20 hydro-massage jets, you can stand or sit whilst enjoying an invigorating massage from the jets. The Genesis control panel operates the steam functions, music, the lights and much more. 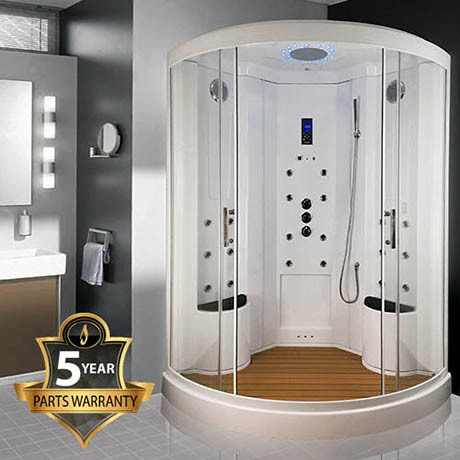 Enjoy the luxury in your master bathroom with this aesthetically beautiful steam shower cabin.